Eggplants belong to the plant family commonly known as nightshades, and are related to the tomato, bell pepper and potato. 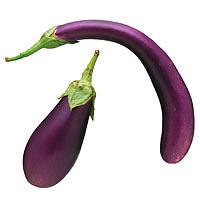 Eggplants are best known as large globe shaped and deep purple in color. But, they are also available in long, thin, forms, which are also known as Asian eggplants, and other colors include lavender, jade green, orange, and yellow-white, as well as in sizes and shapes that range from that of a small tomato to a large zucchini. While the different varieties vary slightly in taste and texture, the eggplant can be described as having a pleasantly bitter taste and spongy texture. In many recipes, eggplant fulfills the role of being a complementary ingredient that balances the surrounding flavors of the other more pronounced ingredients. Many people say that eggplants should be salted and left to stand for 15-30 minutes prior to cooking to remove bitterness. Today, breeding has made eggplants more mild. Eggplant is a very good source of dietary fiber, potassium, manganese, copper and thiamin (vitamin B1). It is also a good source of vitamin B6, folate, magnesium and niacin. Zucchini is probably the best known of the summer squashes, zucchini is a type of narrow squash that resembles a cucumber in size and shape. It has smooth, thin skin that is green and can be striped or speckled. Its tender flesh is creamy white in color and features numerous seeds. Its edible flowers are often used in French and Italian cooking. Avoiding washing zucchini before storing. Store in plastic bags in the crisper drawer of your fridge. Stores well for up to a week. 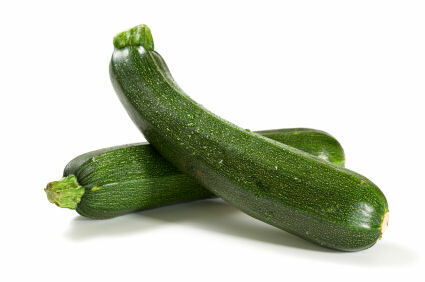 Some simple ways to use summer squash: sprinkle grated zucchini or other summer squash on top of salads and sandwiches. Saute summer squash, onions, bell peppers, eggplant and tomatoes and then simmer the mixture in tomato sauce. Season to taste. Serve raw summer squash with your favorite dips. Add summer squash to your favorite muffin or bread recipe; decrease the amount of liquid in the recipe by about one-third to compensate for the moisture present in the squash. The carrot is a plant with a thick, fleshy, deeply colored root, which grows underground, and feathery green leaves that emerge above ground. It is known scientifically as Daucus carota, a name that can be traced back to ancient Roman writings of the 3rd century. Carrots belong to the Umbelliferae family, named after the umbrella like flower clusters that plants in this family produce. As such, carrots are related to parsnips, fennel caraway, cumin and dill. There are over 100 different varieties that vary in size and color. Carrots can be as small as two inches or as long as three feet, ranging in diameter from one-half of an inch to over two inches. Carrots are an excellent source of antioxidant compounds, and the richest vegetable source of the pro-vitamin A carotenes. Carrots’ antioxidant compounds help protect against cardiovascular disease and cancer and also promote good vision, especially night vision. The trick to preserving the freshness of carrot roots is to minimize the amount of moisture they lose. To do this promptly remove their greens and make sure to store them in the coolest part of the refrigerator wrapped in a paper towel and placed inside a plastic bag; the paper towel will reduce the amount of condensation that is able to form. They should be able to keep fresh for about two weeks. Carrots should also be stored away from apples, pears, potatoes and other fruits and vegetables that produce ethylene gas since it will cause them to become bitter. Wash carrot roots and gently scrub them with a vegetable brush right before eating. Unless the carrots are old, thick or not grown organically, it is not necessary to peel them. If the stem end is green, it should be cut away as it will be bitter. Depending upon the recipe or your personal preference, carrots can be left whole or julienned, grated, shredded or sliced into sticks or rounds. The greens are NOT eatable. Sorrel is a tricky one. Not because it’s difficult to use, but because so few people know what to do with it! And here is a link to a few more recipes on Epicurious.com. Happy cooking, and hopefully you got to stop by and say hello at the Boulder Jewish Festival today! It was a beautiful (though windy) day to be out talking about our CSA and our wonderful farmers. Hakurei turnips are a member of the cabbage family. They are different than the old-school, thick-skinned turnips you may be used to and are more similar to a mild radish. The turnip itself is very white and smooth, and the greens are dark green and also edible. The best way to store them is separate from their tops, with a sharp knife, cut the greens off close to the turnip its self, then wrap the leaves in a damp paper towel and store loosely in plastic bag in the crisper bin of your fridge. They will keep for about a week. For the turnips themselves, again, store in a plastic bag in the refrigerator or cool spot in the basement. These will keep for several weeks. Because they are so young, hakurei turnips can be eaten raw, like a radish. They can also be steamed, boiled or roasted. The greens are also really great, and can be eaten too. Use them in any recipe that call for chard or spinach. Braising mix (also saute mix) consists of salad greens that have become too mature to be salad greens. They are meant to be cooked lightly or doused in hot dressing instead of being eaten raw. These greens include (but are not limited to) bok choy, Chinese broccoli, mustards, chards, and kale. Toss a couple handfuls of braising mix into a stir fry. Balance the slight bitterness of baby chard, dandelion or mustard leaves with contrasting or sweet flavors such as persimmon, apple, pear, baby beets, citrus, vinaigrette spiked with honey or a syrupy balsamic vinegar. You can also toss chopped braising greens into a soup or frittata, or serve them sauteed in your favorite olive oil, with pine nuts and raisins, heaped atop crusty toasted or grilled bread rubbed with garlic. Sorrel: A lemony herb, sorrel makes an excellent addition to salads, stuffing, or soups. If you are planning on using sorrel in salads, it’s a good idea to stick with small tender leaves that are fruitier and less acidic. Young sorrel leaves are also excellent when lightly cooked, similar to the taste of cooked chard or spinach. For soups and stews, older sorrel can be used because it adds tang and flavor to the dish.